In 2019 the garden at Ulting Wick is open on Sunday 28th of April 11am – 5pm, 3rd of May 2pm – 5pm, Friday 28th of June 2pm – 5pm and Bank Holiday Monday, 26th of August 2pm – 5pm, Friday 6th of September 2pm – 5pm in aid of the National Gardens Scheme. It is also open to private groups by appointment. 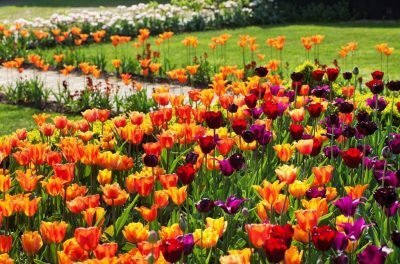 Tulip season in 2019 is very busy and we are taking bookings for the tulip season in 2020. Nestling in the conservation area of the Chelmer Valley in rural Essex the eleven acre gardens at Ulting Wick have been redesigned, extended and developed over the past 15 years by Philippa and Bryan Burrough. The garden is centered around three listed black Essex barns and a 17th century farmhouse. The buildings provide structure, shelter and a canvas for exuberant, colourful and vibrant planting of thousands of tulips in box-edged beds followed by an exotic display of dahlias, bananas, grasses, cosmos, sunflowers and other annuals to provide late summer interest. Away from the barns and the farmhouse the garden extends out into the countryside and the emphasis changes to a more naturalistic and permanent style of planting. Drifts of snowdrops and daffodils start the gardening year off. Mature weeping willows grace the side of a large pond with herbaceous perennials in shady stream beds. Woodland, pink and white theme gardens as well as drought-tolerant borders and a newly-created wildflower meadow provide other areas of interest throughout the season. In addition there is a productive vegetable garden with a Victorian-style greenhouse. This garden has been featured in many articles and magazines includingThe English Garden (2011 and 2016), Country Living, Country Life (Feb 2012 article and September 2012 article) and Country Homes & Interiors magazines, Gardens Illustrated (October 2012 article), House and Garden (April 2014) and Period Homes and Interiors (April 2104) The Royal Horticultural Society “The Garden” 2012, Garden Style (Germany) and Essex Life. In November 2012 the garden appeared in BBC Gardener’s World on the subject of how to plant tulips. Included as a case study in Marianne Majerus’s award winning book “Garden Design, A Book of Ideas”. The garden was included in top 10 Spring Gardens to visit in The English Garden magazine April 2015 and 50 Spring Garden to visit in the UK in the Saturday Telegraph in 2016.